Orange trees grown from seed often do not grow true to the original variety. Some varieties of oranges will only produce sour oranges from seed. However, when growing an orange tree as an ornamental bonsai, the flavor of the oranges is not as important as the form of the tree. The look is primarily a factor of training. Germinating orange seeds for bonsai is no different than germinating the seeds for other growing methods. 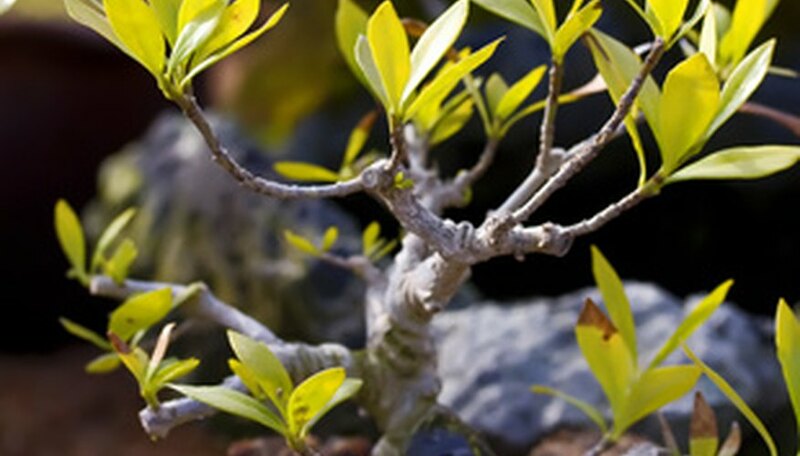 Once the tree begins to develop a woody stem, you can begin bonsai training. Sterilize the potting soil by placing it in a glass or metal pan in a 200 degree F oven until the center of the soil reaches 180 degrees F. Allow the soil to remain at 180 degrees for 30 minutes and then remove from the oven. Allow it to cool before continuing. Save several seeds from a fresh orange. Fill a small pot with the sterilized potting soil. Plant several of the seeds 1/4 to 1/2 inch deep and water the pot until water runs from the hole in the bottom. Place the pot in a warm, sunny window. Make sure the soil does not dry out. Water the soil as it begins to look dry, but do not allow it to become waterlogged. The seeds should germinate in seven to 30 days, depending on the type of orange. Cull the weaker trees until you have a single, strong tree with four to six leaves. Move the young tree to a bonsai pot when it has four to six leaves. Begin training the tree with wire, if desired, once the stem becomes woody. Growing a bonsai orange from seed is a multi-year project. Oranges grown from seed can take from seven to 10 years to begin bearing. However, those years allow you to train a specimen of orange bonsai.